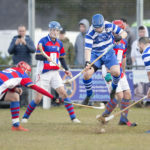 The first cup action of the shinty season took place on Saturday March 30. Skye Camanachd beat Fort William 4-1 in their 3pm throw-up at Pairc nan Laoch, Portree. Padraig McNeil’s late goal earned Fort William a 3-2 win when the sides met in the league a week earlier. At the other end, Jordan Murchison lost his marker and spun round, but his flick went just wide of the post. Ross Gordon and Will Cowie both twice went close, with James Pringle doing likewise, and there was a sense a Skye goal was coming. Skye were immediately forced to make a change as Will Cowie was withdrawn with a tight calf and replaced by Ian MacLellan. Skye extended their lead on 50 minutes. The goal came from a set-piece as Jordan Murchison found Iain MacLellan who pushed the ball goalwards, squeezing it between keeper Paul MacKay’s right foot and the post. MacKay came off his line to save well from James Pringle before diverting a Ross Gordon shot for a corner with his right foot. Skye brought Will Cowie back on at full forward, with James Pringle withdrawn. Skye restored their two-goal cushion on 76 minutes. Paul MacKay saved from Jordan Murchison, but Iain MacLellan ran in from the left to bundle the ball over the line. The goal knocked the stuffing out of Fort William and it was 4-1 a couple of minutes later. Will Cowie played the ball in from the left and Jordan Murchison, in a central position, had time to flick the ball in the air before hammering it past Paul MacKay to make it 4-1. Frustrations grew and Fort William’s Mark Grant was sent off by referee Calum Girvan shortly after following a tussle with Jordan Murchison who was booked. There were also bookings for Skye’s James Morrison and Fort William’s Lewis Morrison. Skye had a number of good performers including wing backs James Morrison and Martin Pringle whilst the midfield of Ally ‘Cleodi’ MacLeod, John Gillies and William MacKinnon showed great power. Sean Cruickshank played well for Fort William, first in midfield and then in defence, and wing centre Lewis Clark was a tireless worker throughout. Stuart Callison put Lochaber ahead on 22 minutes but Ryan MacKay on the half hour and Craig Morrison six minutes later had the hosts 2-1 ahead at the interval. Pat Toal made it 2-2 on 69 minutes but, with 15 minutes remaining, Caberfeidh’s Kevin Bartlett got the winner. Caberfeidh now have a quarter-final tie away to Kilmallie or Newtonmore who meet this Saturday. Lovat’s Lewis Tawse returned but was named as a substitute with manager Fraser Gallacher selecting an unchanged starting 12. Kinlochshiel boss Johnston Gill had David Falconer and Keith MacRae back from injury and both started on the bench. Finlay MacRae was up front again so Donald Nixon continued at full centre. 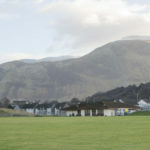 Kinlochshiel, who lost 5-0 at the same venue on the opening day of the shinty season, got off to the best possible start. Kinlochshiel were awarded a free-hit in the centre circle just after the throw-up. Conor Cormack sent the ball into the ‘D’ and John MacRae raced in from the left and got to the ball ahead of the advancing Stuart MacDonald in the home goal to flick the ball into the net to make it 1-0 with just 25 seconds played. Lovat levelled on 34 minutes. Marc MacLachlan gathered Craig Mainland’s free-hit and found Fraser Heath on the left. Heath picked out Graeme MacMillan whose strike was deflected to MacLachlan on the right and he cut the ball back to Greg Matheson whose first time shot beat Kinlochshiel keeper Stuart MacRae low to his right to make it 1-1. With just a couple of first half minutes remaining, Greg Matheson got his second to put the hosts 2-1 up at the break. Graeme MacMillan’s corner from the left was deflected to Marc MacLachlan on the far side. Paul MacRae blocked MacLachlan’s shot, but his clearance went straight to Matheson who struck the ball first time, low across the keeper and into the net. Lovat extended their lead on 73 minutes. Marc MacLachlan and Greg Matheson combined on the left and with Matheson’s shot saved with his feet by Stuart MacRae; MacLachlan was in quickly to turn home the rebound. Lovat rounded off the win with five minutes remaining. The goal came following a Kinlochshiel hit-in. Marc MacLachlan and Calum MacAulay exchanged passes before MacAulay whipped the ball into the net from a central position. Lovat can now look forward to a quarter-final tie at Kingussie. Kinlochshiel’s Donald Nixon goes down in a challenge with Lovat’s Lorne MacKay. Photograph: Neil Paterson. The tie between Strathglass and Inverness at Cannich was postponed as the funeral of Strathglass player Lawrence Jones had been held just 24 hours earlier. Lorne Brown gave Ballachulish the perfect start to the second half when he scored within 60 seconds of the re-start. They were only in front for four minutes, however, before Jamie MacVicar made it 2-2. On 78 minutes, Conor MacGregor got the goal that sent Ballachulish through to the quarter finals where they will face Glasgow Mid Argyll at Yoker. Col Glen’s Ian Wilson and Ballachulish’s Ally Banks were red carded by referee Robert Baxter. Kilmallie suffered their first defeat of the season, losing 2-0 to Kyles Athletic at Canal Parks. Kyles went in front on 12 minutes through Ross MacRae. The goal came following a corner with MacRae netting from the edge of the ‘D’. The match stayed in the balance until six minutes from time when Scott MacDonald cut the ball back and MacRae scored again from the edge of the box. Kilmallie’s Craig MacIsaac tackles Andrew King of Kyles during last Saturday’s Mowi Premiership match. The Inveraray supporters were given something to cheer when Garry MacPherson fired them into the lead on 16 minutes with a great shot. However it was Kingussie, with stand-in keeper Rory MacGregor between the sticks, who knocked in three goals before the break. Roddy Young levelled on 35 minutes and Ruaraidh Anderson put them in front a minute later. Savio Genini made it 3-1 a couple of minutes before the break with a strike on his forehand from the edge of the box. The in-form Genini, a player who really looks to have his ‘mo-jo’ back this season, complete his hat-trick with a volley on 64 minutes and another on 85 minutes when he won a 50-50 ball on the edge of the ‘D’. The Oban side had Ally McKerracher, Andy MacDonald and Lee Askew back, but Michael MacKinnon was missing and Neil Carmichael’s return from injury is still several weeks away. Ross MacMillan was free of suspension and he started in defence in place of MacKinnon. Bute also had absentees and they travelled with just 12 players. Forgrieve was pushed as he made a great run to get onto a ball at the back post. Forgrieve jarred his knee and although he was able to continue, he had to come off shortly after and was replaced by Jamie Anderson. The free hit was played to Ally McKerracher who took a touch and beat his man before rifling the ball home from 20 yards. Bute responded immediately with Craig Fisher pulling a goal back a minute later. Oban Celtic keeper Jack Hill made a save with his feet but was left helpless when the re-bound was tapped in by Fisher. Bute fought back and Craig MacKay showed good movement on 27 minutes to get onto Iain McDonald’s free-hit which he blasted into the top corner of the net to make it 3-2 at the break. Bute took the lead for the first time with 20 minutes remaining. Jack Hill made an initial save to his left with his feet but, as he turned to clear, the ball came off his foot into the net. The hosts, with John Hill solid at the back, were denied a leveller when Bute keeper Kevin Queen made a brilliant save with his caman to keep out Ally McKerracher’s shot which was heading for the top corner of the net. Oban Celtic weren’t to be denied though and Ally McKerracher got his fourth goal of the game on 81 minutes. Rory Bruce played the ball out of defence to George MacMillan. He found Ross MacMillan who picked out McKerracher who scored to make it 4-4. There was still time for a winner and it came from Ross MacMillan with four minutes remaining. MacMillan played a one-two with Ally McKerracher before driving the ball home on the angle to win the game. Speaking after the 5-4 win, Oban Celtic assistant manager Les Kinvig said: ‘The way we started the game was so encouraging. 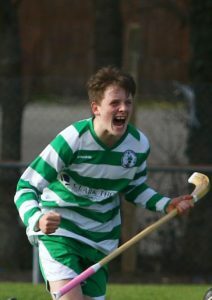 A delighted Ross MacMillan after scoring the winner for Oban Celtic against Bute. Photograph: Kevin McGlynn. Glenurquhart co-managers Stuart MacKintosh and Eddie Tembo travelled without five players including Ewan Brady, James MacPherson and Neale Reid. The hosts made a bright start, with John Sweeney impressive, and took the lead on 21 minutes. The ball broke to Calum McLay who tussled with his marker before firing a shot into the back of the net. The leveller came with 15 minutes remaining. The ball came to Connor Golabek from a hit-in and although GMA keeper Robert Dunnings got a hand to Golabek’s shot, the ball spun high into the net. The hosts opted to play against the wind in the first half but it was Glenurquhart who almost went ahead after five minutes when Ewan Brady found himself free on the left and sent a screaming shot goalwards which home keeper Gordon MacDonald saved with his stick and cleared to safety. Glengarry took the lead on 11 minutes. Nick Dalgety got away from his marker Cameron MacKintosh, which did not happen too often in the game, and ran into the ‘D’ where he was obstructed by Euan Lloyd. Referee John Angus Gillies pointed to the spot and Raymond Robertson stepped up to strike the spot-hit high into the net. The next chance fell to Ewan Brady and, from 20 yards, his shot went narrowly by the post. Glenurquhart should have levelled on 23 minutes. Home keeper Gordon MacDonald came off his line in an attempt to clear a ball into the ‘D’. However the ball fell nicely for Bradley Dickson who only had to tap the ball into the net but missed the target. With young Finlay Ralston having a good game at full centre and Cameron MacKintosh denying Glengarry danger man Nick Dalgety any space, Glenurquhart levelled on the stroke of half-time. Ewan Brady was fouled as Glenurquhart attacked but referee Gillies played advantage and Brady took a shot from 15 yards. Keeper MacDonald saved it but the re-bound fell inside the ‘D’ and Bradley Dickson had the simple task of knocking the ball into the empty net, atoning for his earlier miss. Glenurquhart took the lead a couple of minutes into the second half. Finlay Ralston ran from the halfway line, riding a couple of tackles with advantage again played, before flicking the ball past Matthew Ross and young Lewis MacDonald found space outside the ‘D’ to slam the ball past the helpless keeper. The visitors increased their lead on 75 minutes when the skilful Ewan Brady won the ball 25 yards out and hit a perfect shot into the top corner of the net. Glenurquhart went 4-1 ahead from the throw-up. Lewis MacDonald won the ball on the right from the centre and played an inch-perfect ball towards Donnie MacLennan, who proved a handful for Matthew Ross since his introduction 10 minutes before the break. MacLennan turned Ross and hit a low shot past the keeper on his right side. Glengarry scored their second goal on 87 minutes when the Glenurquhart defence failed to clear the ball and Ruthven Goudie-Hamilton sent an 18-yard shot past the keeper to make the final score 4-2. Cameron MacKintosh was influential for Glenurquhart, shadowing Nick Dalgety, whilst full centre Finlay Ralston was man of the match. Euan Brady was strong and skilful up front for Glenurquhart, whilst Euan Lloyd was solid at full back. Glengarry’s Rhuairaidh MacDonald was one of few Glengarry players who showed the required level of urgency over the 90 minutes. 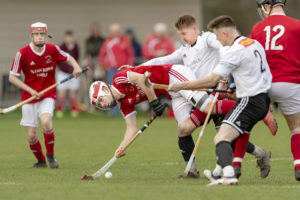 Elsewhere in the league, Daniel Morrison’s hat-trick helped the Skye Camanachd second team to a 4-2 win over Aberdeen University at Balgownie. The Kingussie colts beat the Fort William colts 3-0 in a match switched from An Aird to the Dell midweek. 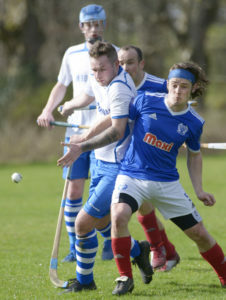 Newtonmore reserves, the reigning champions, got their season under way with a 4-1 victory over an under-strength Lovat reserves at the Eilan. The Kyles Athletic second team got their season under way with a 3-0 triumph over the Inveraray second team at Tighnabruaich. Jack Whyte got the opener, with Luke Thornton adding a double. Elsewhere in the league, Aberdour were too strong for the Glasgow Mid Argyll second team, winning 6-1 at Silversands with David McDougal and Alec Mitchell getting hat-tricks. Martin Ross scored on 27 minutes and again on 30 minutes to give Strathspey an early advantage and Arron McBain’s goal on 42 minutes made it 3-0 at the break. Dane MacPherson added a fourth on 77 minutes with Martin Ross completing his hat-trick three minutes later. Elsewhere in the division, Gregor Cushnie scored twice as Lochcarron won 4-3 against the Inverness seconds at the Bught Park and Duncan Anderson sent the Beauly reserves on their way to a 3-1 victory over Lewis at Braeview Park. Ian Crawford got the other with Ardnamurchan’s Craig MacDonald countering. The match between the Oban Celtic seconds and the Aberdour seconds at Ganavan will be re-scheduled. The league’s two newly-promoted sides, Glenurquhart and Ardnamurchan, met at Blairbeg. Goals from Claire Hannon (2), Donna Mackenzie, Hazel Hunter and Abi Stoddart gave Glenurquhart a 5-0 win. Skye Camanachd Ladies second team beat Lochaber’s second team 5-2 at Pairc nan Laoch, Portree. Abby MacLean scored all five goals, with Claire Delaney and Carla Berardelli replying. Lochaber had Ann Cameron and Jean Campbell playing their first game for the side. The match between Kinlochshiel and Glengarry was switched from Kirkton to Craigard with Glengarry running out 5-4 victors. An Eilidh MacInnes hat-trick and a goal from Isabelle MacKenzie counted for Kinlochshiel but Leona Falconer’s double and strikes from Isla Mackay, Elaine Cameron and Nikki Grant gave Glengarry the win. Fort William were 5-1 victors against Inverness at the Bught Park. Zoe Smith and Leah Maxtone hit doubles with Beth MacDonald getting the other. Amber Mackay got the Inverness goal. Lovat beat Strathglass 5-1 at Cannich. Freya Strachan netted for the hosts but Fiona Urquhart’s hat-trick and Holli Sneddon’s double gave Lovat the points. Dunadd beat Tayforth 13-1 at MacRae Park. Eilidh Cameron was the weekend’s top scorer with ten goals. Grace Drummond grabbed a hat-trick and Rosie Holligan got the other.